If there’s ever a time for a paid app to shed its price tag, it’s around the weekend so that we can spend some time testing it out. Apple’s Free App of the Week promotion for iOS is perfect in that regard, and in the old familiar fashion, it’s bringing over a game which usually retails for $2.99 for absolutely free till next Thursday. 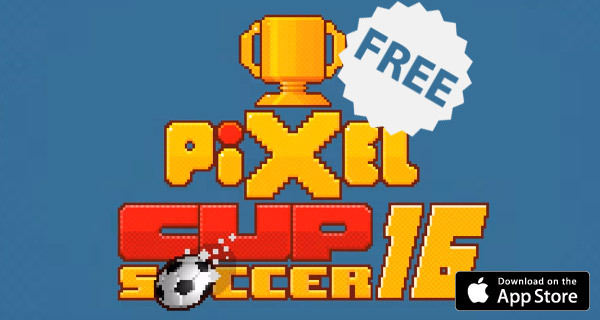 Called Pixel Cup Soccer 16, it is a retro fashioned soccer game which brings back the arcade theme of the 90s to the iPhone, iPad, iPod touch and Apple TV (Yes, Apple TV as well!). 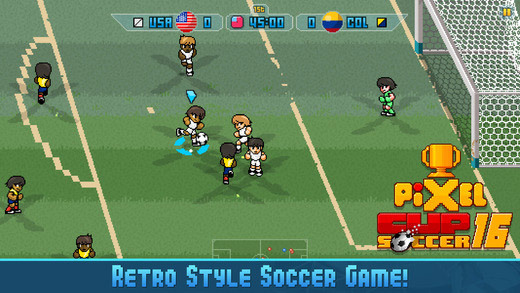 This is the first time the game has completely dropped its price, and if you’re a fan of some fast paced retro-styled soccer, you couldn’t have discovered this development at a better time. Not everyone is bitten by the FIFA bug, and that is where Pixel Cup Soccer 16 comes in with its simplified gameplay which is all about having fun, with no fouls and free kicks, and well, rules to an extent. The controls have also been simplified with the ability to just shoot, pass, and tackle, and tackle you will indeed since the referee isn’t much bothered about the rulebook to that end. While that is good and all, what is even better is the fact that the game once downloaded for free on the iPhone, iPad or iPod touch will also be available for free on the tvOS App Store for the latest Apple TV! Simply pair up a compatible controller and take to the big screen to play with the AI or with other friends. This particular element definitely increases the appeal of an otherwise non-serious soccer game, but the entertainment factor on offer here just cannot be discounted. Oh and to add to that, there’s also support for Party Mode. Deeper gameplay: short pass, long pass, etc., aiming when shooting, controlled shoot or lobs, etc. (all this depending on the context). The game also packs an array of competitions, including Rio 2016 Olympics (men and women), Copa America Centenario 2016 in USA, European Cup 2016 in France, World Cup, Women’s World Cup, and more. So what are you waiting for? Download the game right now from the App Store for free!